Official Summary (add to Goodreads): So much for the quiet life. Just as assistant US attorney and brewery owner Dominic Price is settling into a comfy new chapter with his partner, FBI agent Cameron Byrne, the sudden death of Nic’s father puts their happily-ever-after in jeopardy. Nic immediately suspects foul play, his prime suspect a notorious gangster his father was indebted to—only now the loan shark is out for blood. 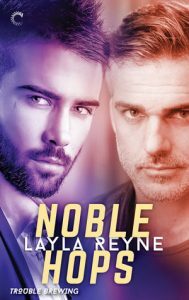 Review: If you’re a fan of m/m romance, then I highly recommend author Layla Reyne. She writes some amazing books. Noble Hops is the third and final book in the Trouble Brewing series, which is an off-set of the Agents Irish and Whiskey series. I loved all of the Trouble Brewing books, but Noble Hops definitely deserves all the stars (I gave it 5 on Goodreads). I think Nic and Cam make an amazing team, both professionally and personally. I’m really bummed this is the final book in the series – maybe we’ll get a short story or two? A girl can hope. What’s great about Noble Hops and the others in the series is that while there is a romance, there is also a lot of action and mystery. If you’re new to m/m romance, or don’t like just romance books, then I recommend all of these because you really do get a nice mix of genres! Noble Hops is a wonderful finale to the trilogy. These are books you’d want to read in order, as they not only follow Nic and Cam, but a larger story/mystery also connects them all. I thought everything came together really well, and I was definitely satisfied with the ending. Highly recommend! If you haven’t seen them already, I also reviewed books 1 and 2 in the series: Imperial Stout and Craft Brew. It’s great that you have a great author like that! I haven’t tried her stuff, but this does sound like a good series. I like that it’s more than just romance. I will have to check out the previous books. I remember you liking the other Trouble Brewing books so I’m glad you enjoyed this one as well! It’s always nice to find an author that you enjoy! This sounds like a really great series. I’m glad to hear you enjoyed it so much. Yay for getting through a series but boo because it is always sad. I haven’t read a good series in what feels like ages! I need to read more. I say this all the time. I love when series get better by the end, or at least stay as good as the first one! Great review! Reyne is a new one to me but I’ll definitely be checking her out. I like the fact that there’s a lot more going on here than just the romance. I didn’t love this one but I think it was still a solid series and I hope there’s more too. Always wonderful when the final book delivers. So glad you are loving this author and series. I’ll have to check out some of this author’s books sometime as I like the sound of them. I like it when the romances gets combined with a mystery and some action as well. Great review!